In September of 2006, on a routine visit to my OB/GYN my doctor felt that something was wrong during my exam. She said that it felt like my uterus was enlarged and speculated that I might have a fibroid cyst. She further stated that she wanted me to stay and get a sonogram that day. When I asked if I could make an appointment to have it done on another day because I needed to pick up my son from pre-school, she basically said no and asked if I could make other arrangements for him so that I could get the sonogram done that day. I redressed, got my appointment information, and went out into the courtyard to call my husband to inform him he would need to pick up our boys from school. I was still feeling Ok when I dialed his number but as soon as I heard him say hello, I broke down. I had been a patient of this doctor for over eight years. She had delivered both of my sons. I knew that if she would not let me go home until I had a sonogram that something must really be wrong. Steve immediately left work and came to sit with me before my appointment. We tried to speculate what it could possibly be. I don’t think either of us would ever have guessed it would be cancer. The sonogram showed what appeared to be an ovarian cyst or an enlarged ovary. More appointments were made. The next week I had the first of many CT scans and by the following week I was in the hospital having surgery to remove what we thought was an ovarian cyst. As it turned out, I ended up having a complete hysterectomy and was officially diagnosed with ovarian cancer on October 17, 2006. I remember the day of the surgery very well. My doctor had prepared me for the different scenarios: It may just be a cyst but because of its size they were going to remove the ovary as well. But she also did prepare me that if there was anything suspicious looking that they would perform a complete hysterectomy. I remember my doctor waking me up after the surgery. She was the first face I saw. I remember her words exactly, “Lisa, there was cancer in your left ovary. We had to take everything. But you are going to be okay.” Just thinking about those words bring tears to my eyes because even though I went into the surgery knowing the possibility that this could be more severe than an ovarian cyst, I never really thought I would have cancer. I don’t know if anyone can ever be prepared for the diagnosis of cancer. I was 36, a runner, a healthy eater, a wife, a mother of two young boys. It just didn’t seem possible. It just didn’t seem real that I was now talking to an oncologist. Three weeks after my surgery I had to start chemotherapy. Even though I had stage 1A ovarian cancer, which means that the cancer was confined to the one ovary and had not spread, I still had to undergo 6 rounds of chemo as more of a precaution that there were no cancerous cells left behind. Going thru chemo was probably one of the scariest things I had to go through in the whole ordeal. I really did not even know what chemotherapy was. I started with chemo every 3 weeks but because the chemo was extremely hard on my body and my blood counts would drop to dangerously low levels, the chemo was pushed out to every four weeks. In some ways that was a relief because it gave me more time to recover between sessions but it also prolonged the time I would have to go through it; therefore, meant that it would be that much longer before I would be able to start getting my life back to normal. After a chemo session it would take about a week to really get back on my feet again. My family really pulled together during this time and my sister and mother alternated coming to stay with us to help Steve take care of the boys and my in-laws who thankfully live here, helped with their care as well. It was a time in my life when I saw my family really reach out to help. Having cancer changed me in many ways. I can honestly say that my cancer made my very good marriage even better. What strengthens a marriage more than having your husband shave your head? My husband was there with me every step of the way, holding me up and helping me through the toughest of times. Having cancer also changed my relationship with my children. Though they were very young at the time, I remember special times when my four year old would hold my hand when I had to get shots to boost my white blood cell count and when my older son left a note on my bed asking God to heal me. 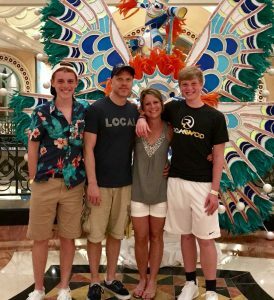 No one has ever said that motherhood was easy, but when faced with the possibility of my children not being able to grow up with me, it made me cherish them even more and to make every day with them memorable, even now when they are grown teenage boys who tower over me. One of the most wonderful things that came out of my illness was to see how many people were there for me and for my family, wanting to help in any way. I was so touched when I found out that several pastors at our church at the time came to visit me in the hospital. They were there for my family to help them and give them prayer and strength when they learned the news that I had cancer. The night I returned home from the hospital, my moms group from church had meals lined up for us that lasted for months. People I had not heard from in a long time were calling, coming by, sending me cards, flowers, and gifts to help me cheer up. It was a wonderful display of love and community and I don’t know how we would have pulled thru the hardest of times without our family and friends. I can definitely say that cancer changed so much about me. It helped me really find the significance in my life. It brought the close relationship I had with my husband and children even closer. It brought me closer to my family. Having cancer made me cherish each and every day, every birthday, even every dreaded line and wrinkle. Life is a precious gift and I’m just so thankful each and every day that I am here to share that gift with others.